For years, Jolene Philo's son was hospitalized many times as he battled a life-threatening birth defect. Far from home, without friends and family to support them, Jolene and her husband felt utterly and completely alone. Today, support networks for parents of critically or chronically ill children have improved, but most only provide for urgent physical needs. The devotional meditations in this book address the spiritual needs of these parents as the author shares her own life lessons, as well as those of other parents who have walked this road. "No matter how difficult the road," Philo writes, "you do not have to lose hope." 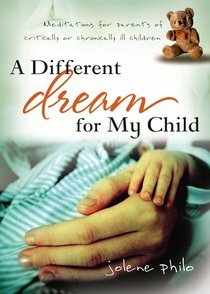 About "A Different Dream For My Child: Meditations For Parents of Critically Or Chronically Ill Children"